So, the masterpiece is done. Now what? Should you self-publish your book? Use print-on-demand? Try to find a publisher, or start your own publishing company? 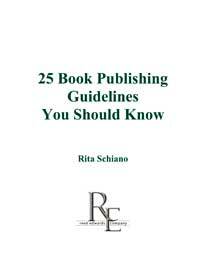 25 Book Publishing Guidelines You Should Know by Rita Schiano will help you sort out which book publishing direction is best for you, as well as provide “insider” tips on wading through the process. Should you hire an editor, copyeditor, or proofreader...and how to determine which you may need. ..... and 18 more guidelines, a list of resources and web sites to help you get your book published, and words of wisdom to keep you on track. "Rita Schiano's 25 Book Publishing Guidelines You Should Know offers just the right amount of help to clarify the jungle called publishing. A wonderful guide, filled with resources and great tips."